This recipe is pretty straightforward, which good food should be, right? For this recipe, boneless, skinless chicken breasts are sautéed in the Instant Pot - but you can grill or even bake the chicken to your preference. The key thing is to make sure it's fully cooked for the sandwiches. Once cooked, the chicken is placed on a toasty bun. The toppings are what make this sandwich - onions, peppers, mushrooms and melted cheese. 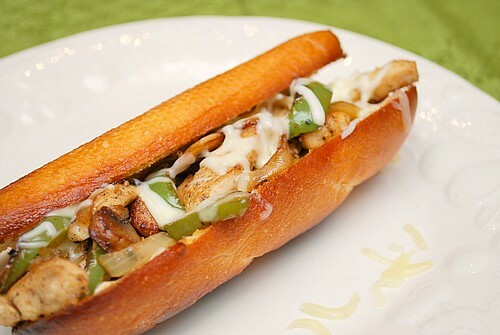 I caramelized the onions, peppers and mushrooms to really add a depth of flavor to the sandwich. As for the cheeses, I used a combination of mozzarella and provolone, which was shredded. You can use slices if you prefer too. I found the shredded cheeses make it easier to melt. Top the chicken with this mixture and you've got yourself a tasty sandwich! Plug in the IP with insert set in place. Preheat broiler. Toss chicken with 1 tablespoon oil; season with salt and pepper. Press SAUTE on the IP and add seasoned chicken and saute until cooked through. Meanwhile, on a baking sheet, toss together peppers, onion, mushrooms, garlic, and remaining tablespoon oil. Add to IP tossing occasionally, until crisp-tender and slightly caramelized, 8 to 10 minutes; season with salt and pepper. Transfer chicken and bell pepper mixture to baking sheet. 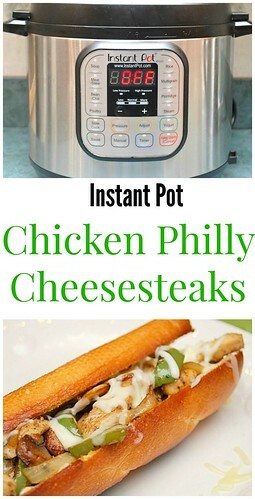 Top chicken and vegetables with cheese; Broil until cheese is bubbling, 30 seconds to 1 minute. Scoop out most of the doughy center from both halves of rolls; discard. Spread rolls with butter ; fill with chicken and bell pepper mixture. Serve immediately.